Life Before the Dinosaurs: Siphusauctum. Siphusauctum is a newly discovered animal from the Burgess Shale. It is one of the weirdest animals from the Burgess Shale ever found. Siphusauctum was described by Jean-Bernard Caron, Curator of Invertebrate Paleontology at the Royal Ontario Museum, and Lorna J. O'Brien from the Department of Ecology and Evolutionary Biology at the University of Toronto, and was just announced. One of the most obvious things about Siphusauctum is how enigmatic it is. It looked like a ctenophore on a stalk. Some scientists believe that it is related to the mysterious Dinomischus. 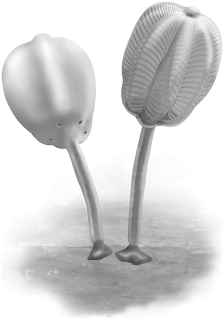 Siphusauctum and Dinomischus both have a stem and a round calyx, but they are actually very different. 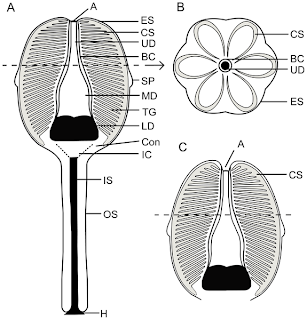 Dinomischus's calyx is more like a flower than a ctenophore. Siphusauctum had a two-layered stem and a holdfast at one end, which was probably used to anchor it to the sea floor. It presumably could draw its holdfast into the stem and move along the sea floor to find a new place to anchor itself. Siphusauctum had a very simple gut, which was just a tube with a round part at the end, which was the stomach. It just sucked in water along with tiny creatures and plants, which were its food. The size range for Siphusauctum is 19 mm to 223 mm. There are variable sizes for stems, holdfasts, and calyxes on different individuals of the species. One thing that stands out about it are the comb rows on its calyx, which resemble those of ctenophores. Although the two are unrelated, Siphusauctum has noticeable similarities with the ctenophores. 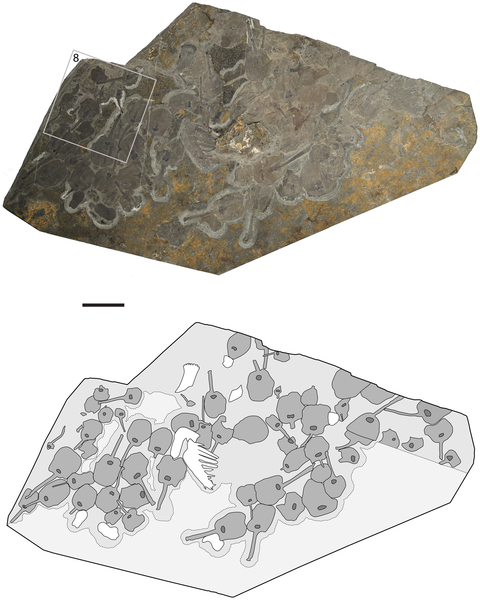 Siphusauctum are sometimes found in large clusters, suggesting that the animal lived in groups, like the possibly related Herpetogaster, also from the Burgess Shale. Its species name is S. gregarium because it was gregarious, meaning it lived in groups. Siphusauctum also resembles some crinoids, except crinoids had tentacles and Siphusauctum did not. Very cool. I look forward to new findings about this creature. How does evolution explain the Cambrian explosion of every major animal body plan in a single rock system? According to evolutionary age assignments, this profusion of forms occured in the lower Cambrian. Stephen Jay Gould writes: "...an elegant study, published in 1993, clearly restricts this period of phyletic flowering to a mere five million years." Was this enough time for evolution to perform all that invention? Musta bin them space aliens. No. Molecular biology has shown that the many species of the Cambrian Explosion evolved millions of years before then. Read "The Ancestor's Tale" by Richard Dawkins. I learned more about Siphusauctum from this post than anything else I've read about it today. The different shapes of the Siphusauctum calyxes, stems and holdfasts makes me wonder why this species had so much variety. I'll have to read more about the Burgess Shale deposits. Thanks, Art, and I hope you have a great time at the Field Museum. I was 10 the first time I went there. This is really interesting. I've never heard of a stalked ctenophore before. I thought that all ctenophores lived in the water column and swam around eating plankton, jellyfish, other ctenophores, and other small creatures. Thank to make to me to discover this new species. The possible link to the Ctenophores is particularly interesting as regard as it was already written about some precambrian sessile creatures, the Rangeomopha like Charniodiscus, having some structure indeed what looked like Ctenophores' ones. Perhaps Ctenophore-like anatomical matrix was more used at the beginning of animal evolution, as Priapulid worms, very more abundent than nowdays. About Ctenophores, there are other rather sessile Ctenophores, species from Lyrocteis genus. I put a link to your blog on the mine, a french blog about real and fictional creatures, including sometimes some vulgarization articles about zoology and evolution - and minor groups of invertebrates are not forgotten, of course. I am proud to be the first French to speak about your blog ! I am myself interested since young age both by Burgess creatures and precambrian ones. I wish to you a good travel to the Chicago natural history museum ( I came a bit too late to participate myself ! ). Perhaps you would find a bit funny to see it.